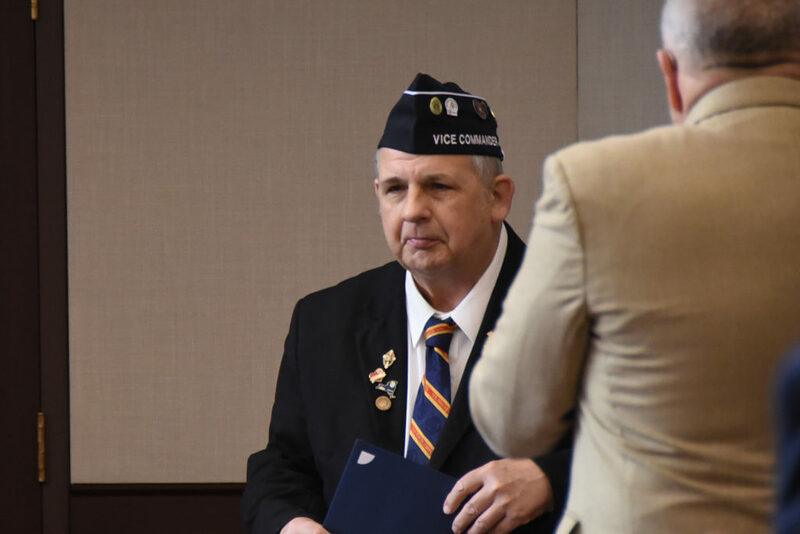 LIVINGSTON COUNTY — Prior to Livingston County Board of Supervisors meetings there are veterans who stop in to lead the Board through the pledge of allegiance, this week it was Joe Lawrence. Joseph ‘Joe’ Lawrence was born in Buffalo, NY. He was adopted at the age of 10 months and moved to South Dansville, where he grew up on a small farm. Joe graduated from Dansville Senior High School in 1970, and enlisted into the Navy in 1971, serving until April 1975, when he was Honorably Discharged as a Builder Third Class. While servicing in the Navy Joe attended boot camp at Great Lakes, Ill. Following boot camp he joined the Seabees (the construction part of the Navy) and was sent to Port Hueneme, CA for 12 weeks of Builder “A” school. After graduation, Joe was sent to Davisville, RI, where he was assigned to ‘Naval Mobile Construction Battalion 71’, and deployed to a small island in the middle of the Indian Ocean called Diego Garcia for eight months. Joe went to South Pole, Antarctic, where he helped build a new Pole Station, while enduring temperatures of -50 degrees Fahrenheit, and Joe’s last deployment was in Bermuda. Joe joined the Naval Reserves in Horseheads, NY in 1985, as a Hospital Corpsman. Upon graduating from Corp school in December of 1986, Joe’s unit was attached with Bethesda Medical Center out of Bethesda, MD, where he went for active duty. In the spring of 1991, Joe was activated for Desert Storm and sent to Newport, RI, where he helped set up a hospital for incoming wounded soldiers from Desert Storm. In 1995 Joe transferred to the Naval/Marine Corp Reserve Center in Chili, NY. Joe drilled with the Marines, and was sent to Field Medical School, in Camp Lejeune, NC. After graduation, Joe drilled with the 4th Marine division, 8th Tank Battalion, for the next five years. After 16 years in the Reserves, Joe decided to retired from the reserves in 2001. Joe’s awards include the Good Conduct Medal, the Antarctic Service Medal. Following his retirement from the Reserves, Joe got a job with Foster Wheeler, in Dansville, NY, which had a contract with the Navy to build boilers for their ships. After nine years with Foster Wheeler, using his GI Bill to go back to school, Joe became a LPN. Joe worked at Canandaigua VA, Westfall Out-Patient Clinic, and various nursing homes. Joe currently lives in Nunda, NY, and helps take care of his girlfriend. Joe is involved with the American Legion. He started in 2015 with the Dalton American Legion, Arland Kelley Post #1569, where he served as a Post Adjutant, and two years as their Post Commander. In 2017, he transferred to the Daniel Goho Post #87 in Dansville, NY, where he is a current member. Joe is active with the Livingston County American Legion where he served as their Third Vice Commander and presently their First Vice Commander. He is also the historian for the Seventh District American Legion. Joe helps out the South Dansville Volunteer Fire Company with fundraisers, where he has been a member for several years. Joe is a life member of the Penfield Volunteer Fire Company. Joe was a previous member of the Penfield Volunteer Ambulance Company, the South Hornell Volunteer Fire Company, and was a CPR/First Aide Instructor for the Hornell American Red Cross. Joe is a life member of the Dansville Volunteer Ambulance Company. In March of this year, Joe will celebrate his first year as a member of the Fraternal Order of Masons, at the Nunda Station Lodge #682. Joe has five children, four granddaughters, and one great granddaughter.